Swallows eat a large number of insects every day, making them a welcome site both on farms and other areas where the bug population can be a problem. For this reason, swallows are usually a welcome sight – that is, until they decide to build a big, messy mud nest on your property. 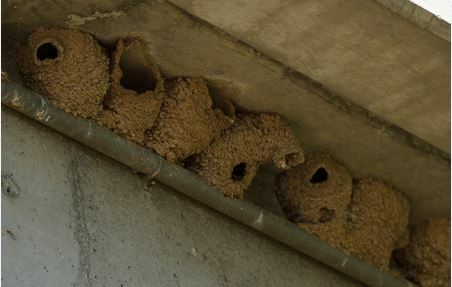 Swallows typically build their nests on man-made structures, frequently finding homes under eaves and overhangs and even on the sides of roofs or walls. Made out of mud, these nests deface and damage property both with the mud and the droppings of the birds as they come and go. This also means the hassle of a time-consuming clean up. To make matters more difficult, the federal government protects swallow nests. It is illegal to tamper with a swallow’s nest until Sept. 15, as this gives swallow eggs a chance to hatch during the nesting season to help increase the population. To stop swallows from returning and making a mess of your property, it’s important to be proactive about cleaning out nests and putting an exclusion plan into place as soon as nests can be removed in September. At Birds Away, we can remove any nests that are already in place, cleaning and sanitizing the area where the swallow built its home. Once the nest is removed, we can also assess your property and offer a range of deterrent options to help prevent the swallows from returning in the spring. Netting is the most popular deterrent for swallows. Adding netting over possible nesting grounds can block the swallows from building their nest in a place that is comfortable for them. The netting doesn’t even need to fully block off the area, as even a piece of netting hung like a curtain can often have the desired effect. Our experts can inspect your property and offer recommendations on the exclusion netting style that would work best for your home or business. September is coming up fast, so now’s the time to start planning for clearing out these unwanted swallow nests. Swallows are beautiful birds that definitely improve the environment where they live, but their nests do cause real problems for property owners. Find out more about nest removal, cleanup and prevention by giving us a call today at 925-798-9041.